International school recruitment, with special discount pricing for AISH member schools. We match international schools with qualified candidates using our purpose-built platform. We work globally to find the best teachers, leaders and specialists worldwide. You can find out how we do it here. Our prices are low, and simple. Get free account users as an AISH member. Sign up as an AISH member and as well as our standard free trial, we also give you a second admin user for your membership year totally free. As with AISH, our members are truly global. Below is a map showing active users in the last year and new users are joining all the time. 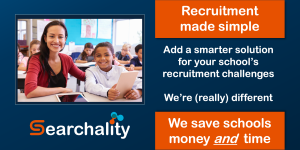 Please do explore our site to find out more about how Searchality can help you. As you’ll discover on our pricing page, the trial is fully functional (with no limitations on creating position descriptions, or hiring staff) and totally free! Once you have created your free trial account, email us or contact us here and we’ll help you take advantage of the free extra user account. After your free trial, as part of your AISH membership we will give you 1 additional user free with your paid subscription for your first membership year. Learn more about our simple per-user pricing on our pricing pages. © 2019 Searchality Ltd. Registered office: Kemp House, 152 City Road, London EC1V 2NX. Registered in England No 10874058.